Trained as a painter I work with a wide variety of media and approaches, including drawing and painting from observation to work with found or cast objects, clay, book forms, installation, printmaking and, almost always, photography. My White Horse Dialogue Series is inspired by nostalgia and the idea of art as a surrogate for that which we cannot have, what we desire to possess or harness. 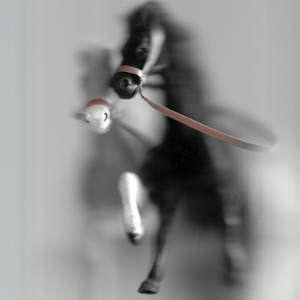 At first glance these images might read either as photographs or paintings of horses in motion. Upon closer inspection one sees they are not based on actual horses at all but plastic playthings. Perhaps our interactions with art and images and the imaginative play of childhood have something in common? The images were created as a result of a collaborative project entitled Picturing Dialogue with book artist and photographer Ginger Burrell. I was given a photo of a stationary carousel horse and asked to create a photographic response. As my point of departure I too wanted some sort of inanimate horse but wanted instead to make it look as though it were moving and not still. I wanted to make something ìpainterlyî as Iíd grown tired for the moment of photography. I had the painters Delacroix and Gericault vaguely in mind. But because our project parameters insisted upon photography I decided Iíd try experimenting with alternative methods and put my traditional camera aside. In the end I began playing with my daughterís toy horses, among her favorite toys, and started using an office scanner to create mini, makeshift studios. The resulting images have been a fun and unexpected surprise. Media and Visual Arts Exhibition Catalogue; ISIC 2nd International Symposium. Izmir, Turkey: Izmir University, 2013.